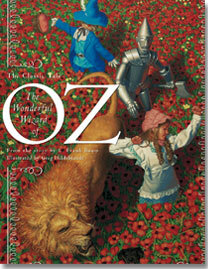 Originally published in 1900, the story of Dorothy's trip to Oz was the first truly American fairy tale. Here's a dazzling new way to enjoy L. Frank Baum's classic story about the little girl from rural Kansas who flew away on a tornado. Lavish full-color illustrations by Greg Hildebrandt, one of our finest fantasy artists, bring to life the world of the Tin Woodman, Cowardly Lion, Scarecrow, and Wizard.